A grizzly bear in 2011 in Yellowstone National Park. A federal judge restored the species to the endangered list on Monday. "I'm feeling relieved," said Matthew Bishop, an environmental attorney representing WildEarth Guardians. He helped represent tribes and conservation groups in a lawsuit filed after the grizzly bears were delisted in 2017. Bishop argued the U.S. 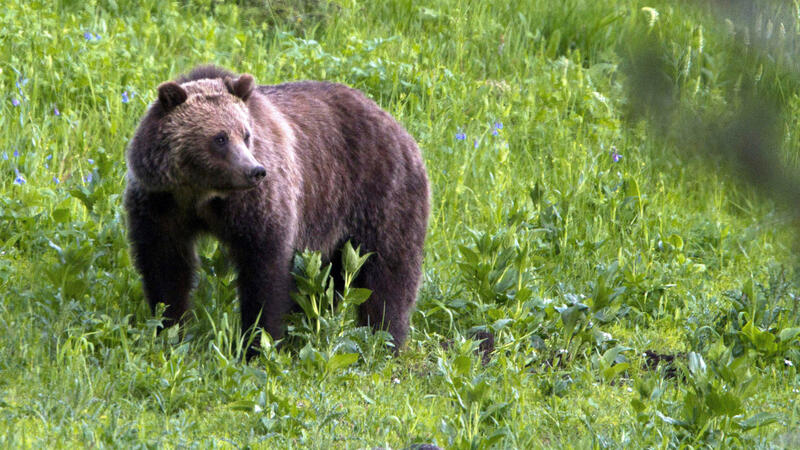 Fish and Wildlife Service couldn't delist the animals in one isolated spot without considering the impact on threatened grizzly bears living in other places in the Lower 48 states. "When you commit to recovering a species in the Lower 48 you should do that," Bishop said. Christensen agreed. In his decision, he said grizzly bears don't roam everywhere in the West like they used to. Instead they live in isolated pockets, and the federal regulators can't delist those isolated pockets until the grizzly populations start connecting together. "The Service cannot abuse its power to delist an already-protected species by 'balkanization," Christensen wrote." Prior to the ruling, wildlife agencies in Wyoming and Idaho planned to let hunters kill up to 23 grizzlies during its first hunting season for the bears in three decades. It was set to begin on September 1 before Christensen granted a temporary restraining order on August 30. Many ranchers near the nation's oldest national park lauded the hunt. "There are people that encounter grizzly bears as part of their daily lives," attorney Cody Wisniewski said at an earlier hearing. He represented Wyoming ranchers and farmers in the case and said his clients liked having the states in charge. "Their goal is just to have local management. To be able to go to their local representatives, their elected officials, the people that live in and beside them in their state in order to resolve any disputes," he said. According to Montana Public Radio, U.S. Fish and Wildlife Service spokesperson Jennifer Strickland said the federal government will "work with the state and tribes to ensure that this transition proceeds in accordance with the court's order." Bishop, who represents WildEarth Guardians, noted the federal government could appeal the decision, which could also impact the proposed delisting of grizzly bears living in the Northern Continental Divide Ecosystem near Montana's Glacier National Park.